Carrara is a small city of 60 thousand people in the north of Tuscany, between the Mediterranean sea and the Apuan Alps. Its name is worldwide known for one expensive and prestigious raw material: the white marble. Above it, more than 200 marble quarries are distributed in 400 square km, divided in three big basins with ridges that raise up to 2000 meters: Torano, Colonnata and Fantiscritti. This is the most productive area in the world with 1 billion tons of white marble mined per year. Marble has been extracted in this valley for more than two thousand years. It has been used to build notable monuments and buildings in Italy and all over the world, from ancient Rome and Michelangelo's sculptures to more recently the Marble Arch in London and the Akshardham in Delhi. Up to the last century Carrara was flourishing. One hundred years ago the city was the heart of marble carving and could claim a famous academy for sculptors. It was one of the first cities in Europe to have electricity, it was rich of industries, services and even wineries for the people employed in the marble business. Following its independent nature, it became the cradle of Italian Anarchism. Then things changed. The privatization of the mountains and the capitalist-globalized context brought in the business many international companies (and the Bin Laden family as well) and moved the manufacturing away from the valley to China and other destinations. The revenues of the quarries stopped to be redistributed in the valley. The number of miners dropped to few thousands due to the use of new machines. Maybe what changed most was the idea of the world and society. Today the old railway and the factories still stand as imposing ruins in the landscape of this run down peripheral city. While prospects for the future seem to shrink, the past is constantly growing. I came to Carrara thinking of it as a metaphor for the Italian decadence and crumbling of our glorious past. The marble that was used to decorate our cities and to celebrate our power and richness now is shipped to New York City, to the Arab Emirates, to Russia, to China and wherever the power has placed itself. The marble is aggressively removed by these beautiful mountains that have changed dramatically their shape due to human intervention: the people of Carrara live in a white cradle that they are steadily and cruelly destroying until nothing will be left. But what I found is a crowd of tenacious people. Today anarchism and proudness seem quite forgotten, but a soft rebellion, a sense of freedom and even of openness to strangers and diversity seem to spark in the city. Covered of white powder, punk, concerned and passionate people don’t bend their heads: they want stubbornly to sprout and live. Carrara is historical but innovative, strong but soft, solid but tender, italian but international, like its marble. The same marble, that was used to build our religious and political temples, seems to ask to renew our concept of who we are and what we could be in the future. Maybe Carrara, more than a metaphor, is a feeling of hope. I focused my photographs on night view of the quarries and the portraits of individuals engaged in art making. The words of an italian sculptor, Arturo Martini, come to mind: photography is similar to sculpture, it’s made by a cast of light. Left: One of the marble quarries in the Fantiscritti basin, behind the city of Carrara. The basins are inside the protected area of Alpi Apuane, which are defined "Alps" due to their morphology and are a mountain system that goes from the north-west of Tuscany and spreads over a surface of 400 square km. The mountains are formed by a dorsal which runs parallel to the Tirrenian coast and raises up to 2000 meters. 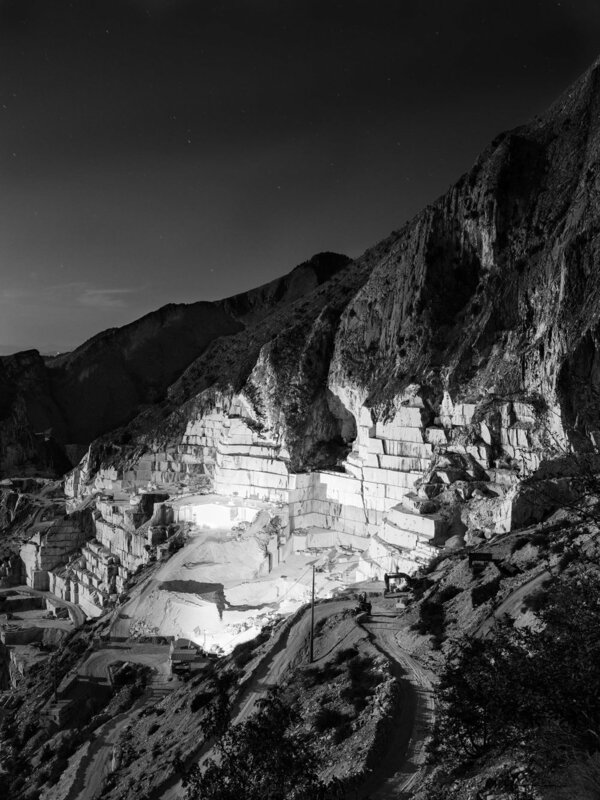 In Carrara 18 torrents separate about 200 marble quarries. Right: Dominik is employed in the hardware shop (and marble tools) called Tabularasa, in the center of Carrara. Marble here has been here a raw material, and a culture as well, for more than two throusand years. Carrara is the nevralgic center of a peculiar and international crowd of artists. Two hundred sculptors are living permanently in the city. Many are punk, anarchists, and have a rebel way to live their life and their art. Romhein Boutros is a sculptor of syrian origin living in Carrara since 1982. He teaches how to work the marble in international programs (especially with German speaking countries and the East). He's currently working on a single piece of marble weighting 60 tons that will become the sculpture of a lion for a private park in New York City. Left: The Vara Bridges, called the three twins, stand in Miseglia, ten minutes away from the city of Carrara, at the very beginning of the marble basin of Fantiscritti. In 1890 a railway line called "Marmifera" was built to facilitate the transportation of marble to the valley. Today it has been dismantled and only few imposing ruins remain. Right: Stefanie is a german sculptor running a studio called F.A.C., that sounds in italian like the F word. She moved to Carrara ten years ago to study at the fine arts academy, and never left. At the end of the 19th century Carrara became the cradle of anarchism in Italy, in particular among the quarry workers. Anarchism and general radicalism became part of the heritage of the stone carvers. Today anarchism and proudness seem quite forgotten, but a soft rebellion, a sense of freedom and even of openness to strangers, seem to spark in the city more than in other territories in Italy. Piazza del Duomo is the main square of Carrara. Every year they celebrate "Carrara in white", performing music in the city and asking all the residents to dress in white, like marble. This is a nice initiative in a city that is generically perceived from its own citizens as ruined down and defeated. People of Carrara are historically considered the opposite: they were not conquered by the Romans, neither from Florence in the Renaissance. More recently, during World War Two, a march of women and children sent away the Nazi troops from their city. 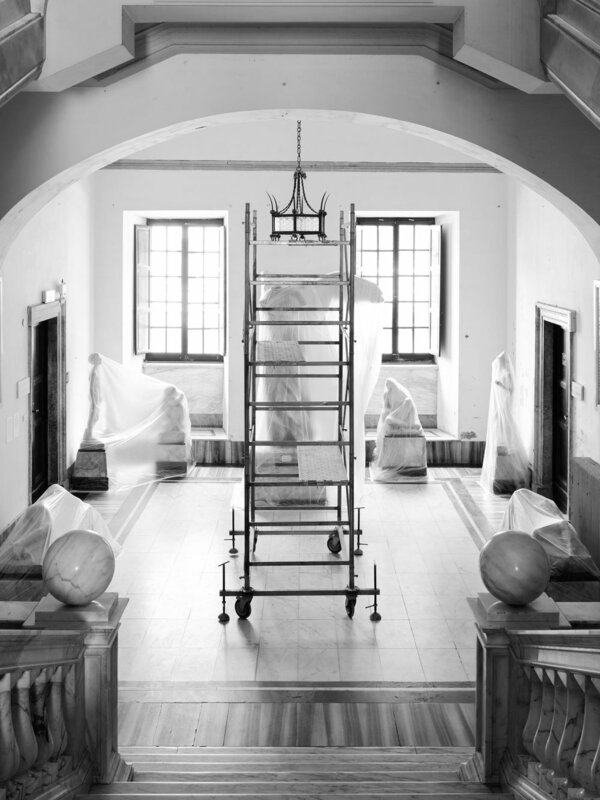 Left: A sculpture inside the Carrara Academy of Fine Arts. In the main building of the academy, they store archeological evidences that marble has been extracted and worked here for more than two thousands years. Every year, a very international group of students come in Carrara to learn how to work the marble. Some of them, the hospital reports, have carpal tunnel by age 21 due to the intense use of ancient instruments, and the refuse of modern tools. Right: The main door of Saint Augustine church in the small city of Pietrasanta, few kilometers from Carrara. A huge track, similar to the ones we find in the marble quarries, is inserting its arm in the Church to perform some heavy work. Pietrasanta is renown for his marble workers. Churches in Italy have been built using a large amount of Carrara marble. View of Bedizzano miners' village, at the feet of the Colonnata marble basin. There are many villages close to the quarries, once populated by the workers employed in the marble industry. Due to the use of machines, today the number of miners has lowered to few thousands. In the last decade only, the amount of workers has decreased by 30%. While the marble industry is always flourishing, the economy of Carrara's area has been crushing: textile factories, typographies, photo shops, wineries (once related to the quarries) and all sort of businesses have been shutting down in the last 60 years. Fantiscritti truck trail by night. Torart is an art studio based in Carrara employing 3D sculpture and new technology to the production of sculptures for churches, museums and artists. Recently they have been reproducing the arch and status destroyed in Palmira by Isis. The turning shop of Daniele Spinetti. This laboratory has been run by the same family for three generations. Straight after the Second World War, the grandfather of Daniele built many of the machines by himself repurposing part of American tanks and military wagons. Left: Uta is an austrian sculptor that has been spending her summer renting a studio to work in Carrara for the past ten years. She said: "everywhere you are in the world, as soon as you start working with marble, you feel you want to come here. It's not even you're looking for it, it's Carrara calling you". Right: A saw to cut huge pieces of marble in the turning shop of Daniele Spinetti. Details from one of the studios of Romhein Boutros, a syrian artist living in Carrara since 1982. Boutros says: "This place was sacred already to the Romans. You can find temples in the valley. Marble is something you follow, you don't fight with. Marble is white gold and I can tell it is mine only if I can work it. I refuse to use machines because I want to be the only soul to deal with it." Left: Ira is an Albanian worker in the hardware shop Tabularasa. The shop is less than 10 years old, but is strongly rooted: it's also gallery, library and artists' hub. Right: View of the main hall of the Carrara Academy of Fine Arts. A view of the lower part of Fantiscritti marble basin in the evening, when the wind blows the air from the mountains to the valley of Carrara. The city stands between the Mediterranean sea and the Apuan Alps. The city has about 60 thousand citizens. Because the mountains have been privatized many years ago, very little or none of the income from the marble quarries is redistributed to the city public administration. This project has been made with the support of Fujifilm.